Steven Tyler is known for his bizzare moves on the stage. They are his signature trademark, in addition to his oversized mouth/lips, of course. Aerosmith. LOVE 'EM. Believe it or not I have yet to see them in concert. Key word is yet. 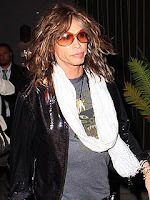 Aerosmith rocker Steven Tyler says he checked into to a rehab facility earlier this month to recover from foot surgeries to repair problems caused by his stage moves. "The doctors told me the pain in my feet could be corrected but it would require a few surgeries over time," Tyler says in a statement released Thursday. "The 'foot repair' pain was intense, greater than I'd anticipated. The months of rehabilitative care and the painful strain of physical therapy were traumatic. I really needed a safe environment to recuperate where I could shut off my phone and get back on my feet. Make no mistake, Aerosmith has no plans to stop rocking. There's a new album to record, then another tour." According to the statement, Tyler was treated at the center after a series of surgeries and post-operative physical therapy "to correct long-time foot injuries resulting from his trademark athletic performance onstage." The statement follows reports the 60-year-old singer was being treated instead for substance abuse. Rock On Old Man....Rock On.